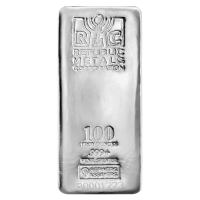 Stříbrný slitek společnosti Republic Metals 100 oz Republic Metals Corporation silver bars are entirely refined and produced on site in Florida. Republic Metals is one of the largest primary precious metals refineries in the world, and has been in business since 1980. Each bar has a unique serial number and is new and direct from the mint. Manufactured to the highest standards, these bars are what you have come to expect from a leader in the precious metals market. A perfect way to add a larger bar to your silver holdings!